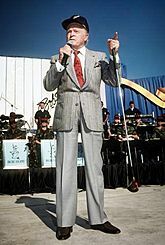 Actor, comedian, and entertainer Bob Hope, who died shortly after he turned 100, was one of the most well known people to become a centenarian. 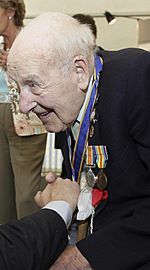 A centenarian is a person who lives to or beyond the age of 100 years. Because life expectancies worldwide are less than 100, the term is associated with longevity. In 2012, the United Nations estimated that there were 316,600 living centenarians worldwide. 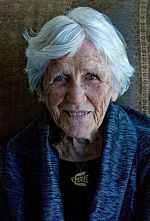 As life expectancy is increasing across the world, and the world population has also increased rapidly, the number of centenarians is expected to increase quickly in the future. According to the UK ONS, one-third of babies born in 2013 in the UK are expected to live to 100. A supercentenarian is a person who has lived to the age of 110 or more, something only achieved by about one in 1,000 centenarians. 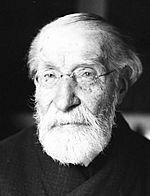 Even rarer is a person who has lived to age 115 – there are only 43 people in recorded history who have indisputably reached this age, of whom only Violet Brown, Nabi Tajima, Chiyo Miyako, Ana María Vela Rubio and Giuseppina Projetto are still living. There has only been one known case of a person of 120 years of age or older, Jeanne Calment, who lived to the age of 122 years, 164 days. 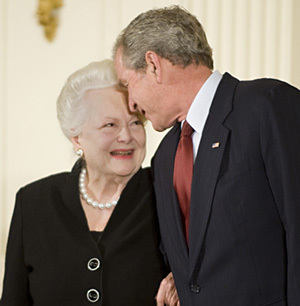 The United States currently has the greatest number of known centenarians of any nation with 53,364 according to the 2010 Census, or 17.3 per 100,000 people. In 2010, 82.8% of US centenarians were female. Japan has the second-largest number of centenarians, with an estimated 51,376 as of September 2012, and the highest proportion of centenarians at 34.85 per 100,000 people. Japan started recording its centenarians in 1963. The number of Japanese centenarians in that year was 153, but surpassed the 10,000 mark in 1998; 20,000 in 2003; and 40,000 in 2009. According to a 1998 United Nations demographic survey, Japan is expected to have 272,000 centenarians by 2050; other sources suggest that the number could be closer to 1 million. The incidence of centenarians in Japan was one per 3,522 people in 2008. In many countries, people receive a gift or congratulations from state institutions on their 100th birthday. In the United Kingdom and the other Commonwealth realms, the British (and Commonwealth) monarch sends greetings (formerly as a telegram) on the 100th birthday and on every birthday beginning with the 105th. The tradition of Royal congratulations dates from 1908, when the Secretary for King Edward VII sent a congratulatory letter to Reverend Thomas Lord of Horncastle in a newspaper clipping, declaring, "I am commanded by the King to congratulate you on the attainment of your hundredth year, after a most useful life." The practice was formalised from 1917, under the reign of King George V, who also sent congratulations on the attainment of a 60th Wedding anniversary. Queen Elizabeth II, sends a greeting card style with the notation "I am so pleased to know that you are celebrating your one-hundredth birthday, I send my congratulations and best wishes to you on such a special occasion", there after each few years the card is updated with a current picture of the Queen as to ensure people do not receive the same card more than once. The Queen further sends her congratulations on one's 105th birthday and every year thereafter as well as on special wedding anniversaries, people must apply for greetings 3 weeks before the event, on the official British Monarch's website. 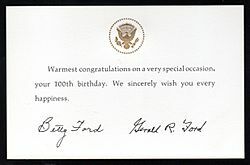 In the United States, centenarians traditionally receive a letter from the President, congratulating them for their longevity. Centenarians born in Ireland receive a €2,540 "Centenarians' Bounty" and a letter from the President of Ireland, even if they are resident abroad. Japanese centenarians receive a silver cup and a certificate from the Prime Minister of Japan upon the Respect for the Aged Day following their 100th birthday, honouring them for their longevity and prosperity in their lives. Swedish centenarians receive a telegram from the King and Queen of Sweden. Centenarians born in Italy receive a letter from the President of Italy. An aspect of blessing in many cultures is to offer a wish that the recipient lives to 100 years old. Among Hindus, people who touch the feet of elders are often blessed with "May you live a hundred years". In Sweden, the traditional birthday song states, May he/she live for one hundred years. In Judaism, the term May you live to be 120 years old is a common blessing. In Poland, Sto lat, a wish to live a hundred years, is a traditional form of praise and good wishes, and the song "sto lat, sto lat" is sung on the occasion of the birthday celebrations—arguably, it is the most popular song in Poland and among Poles around the globe. Chinese emperors were hailed to live ten thousand years, while empresses were hailed to live a thousand years. In Italy, "A hundred of these days!" (cento di questi giorni) is an augury for birthdays, to live to celebrate 100 more birthdays. Some Italians say "Cent'anni! ", which means "a hundred years", in that they wish that they could all live happily for a hundred years. In Greece, wishing someone Happy Birthday ends with the expression να τα εκατοστήσεις (na ta ekatostisis), which can be loosely translated as "may you make it one hundred birthdays". Research in Italy suggests that healthy centenarians have high levels of both vitamin A and vitamin E and that this seems to be important in causing their extreme longevity. Other research contradicts this, however, and has found that this theory does not apply to centenarians from Sardinia, for whom other factors probably play a more important role. A preliminary study carried out in Poland showed that, in comparison with young healthy female adults, centenarians living in Upper Silesia had significantly higher red blood cell glutathione reductase and catalase activities, although serum levels of vitamin E were not significantly higher. Researchers in Denmark have also found that centenarians exhibit a high activity of glutathione reductase in red blood cells. In this study, the centenarians having the best cognitive and physical functional capacity tended to have the highest activity of this enzyme. Other research has found that people whose parents became centenarians have an increased number of naïve B cells. It is well known that the children of parents who have a long life are also likely to reach a healthy age, but it is not known why, although the inherited genes are probably important. A variation in the gene FOXO3A is known to have a positive effect on the life expectancy of humans, and is found much more often in people living to 100 and beyond - moreover, this appears to be true worldwide. Men and women who are 100 or older tend to have extroverted personalities, according to Thomas T. Perls, the director of the New England Centenarian Study at Boston University. Centenarians will often have many friends, strong ties to relatives and high self-esteem. In addition, some research suggests that the offspring of centenarians are more likely to age in better cardiovascular health than their peers. Centenarian Facts for Kids. Kiddle Encyclopedia.